The product is a highly sensitive, high performance switch designed to activate automatic doors by detecting the movement of a person or object. This automatic door switch is installed at the entrance and in the inside of a toilet for the physically challenged to automatically open and close the door. The MS805 is a high performance motion detection sensor specifically designed for the activation of automatic doors. The microwave motion sensor is installed at the automatic door and senses the motion of a man or an object to open and close the automatic door. This sensor is designed to detect intrusion to initiate an alarm, an door controller and so on. The MS730-Bi is a high performance motion detection sensor specifically designed for the activation of automatic doors. Multi-purpose, high-sensitivity and high-performance FM transmitter and receiver to control automatic shutter, sliding door, overhead door, cylindrical motor, and other similar devices from a distance. This product is a AM-mode wireless remote control intended to control remotely automatic shutter, automatic door and tubular motor or the like. The wireless transmitter and receiver for parking control are parking control system to control external vehicles. This receiver controller is installed and managed at the entrance of parking lot and a place requiring access control. The digital door key is designed to automatically open by pressing secret access numbers or making an ID card close to it at every entrance through an automatic door. The product is a highly sensitive, high performance switch designed to activateautomatic doors by detecting the movement of a person or object. High-sensitivity FM wireless touch switch designed to open and close an automatic door. to be able to open the door automatically by entering the password when entrance. 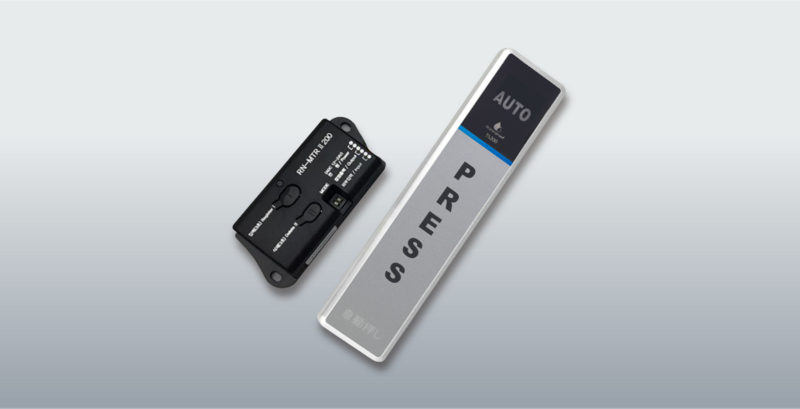 This product is a wireless multi-channel transmitter manufactured to control up to maximum 8 receivers using the FM method near-field communication. This product is a set of wireless transmitter/receiver switches to be installed in the equipment requiring relay contact input to control motor e.g., of automatic door. Newly added Remote control lock function controls all sensor input contact. This product is a high-sensitivity, high-performance products that outputs a relay contact point after detecting moving objects such as cars and other moving steel objects to an automatic door. It is the latest composite sensor with infrared sensor and radar sensor function. It is the latest composite sensor with infrared sensor function. High-sensitivity wired touch switch designed to open and close an automatic door. FT400 is a remote control for automatic door by using 2.4GHz frequency. RITS-N Co. Ltd. All rights reserved.